There is a hapless fellow in our community that came to me because he wanted a job. I asked him what he envisioned as his career-path over the next five years. However, he was not interested in coaching, and only wants a: “job that pays [him] enough to go on missions and lets [him] retire at fifty-five”. In the absence of that, he asked if I would be interested in giving him money for a Ministry that connected people in China and taught them how to play golf. I was, admittedly, skeptical, and, instead invited him to drive around Alpharetta with me to pick up bags of clothes for kids that, for example, don’t have matching shoes. NOTE: This is an effort underway through one of our Shocker Mom’s, Mary Guthrie. He was not interested, some how, in that opportunity. I can’t be certain from whence these people come from. But, come they do. And, I find myself drawing inspiration, of sorts, from them. As readers of this Blog, for example, know, I’ve long evaluated many religions, and draw my actions from many of them. The Christian Bible offers that quote above from the book of John. And, it’s a reminder that, perhaps we need to be open-minded from whence we draw our inspiration, and to keep our eyes open, for all manner of opportunity. I say this, in part, because opportunity abounds today. A current theme of my Blog, of late, has been commodities-centric. Good and bad, success and failure, are all relative. One mans misfortune may be at the hands of another’s great hopes and efforts. An example is a new “home” that was a recent short-sold house, or that purchased after a foreclosure. Of course war, and competition are other examples. In any event, the imposing image of the above pictured canine offers critical perspective in terms of how we can see the world around us, and how we treat and relate to the gifts around us. Pick your battles carefully. Seek truth and light. Serve where you can. Be an example. Disclaimer: Obviously, the animal pictured above is not Rowdy – and, that is certainly no sofa I’d have in my possession (at least in this decade). 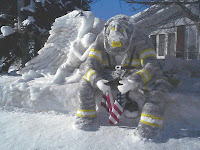 I was a Member of the Louisville Volunteer Fire Department in Lousiville, Colorado from 1993 to 1998. Being a Firefighter and Emergency Medical Technician (“EMT”) was one of the coolest and most fulfilling things I have done with my life. But, I feel that I learned the most about helping people, and having a Servants Heart from Larry. There is a lot of tedium around being a Fireman. Fire Calls and Emergency Services are exciting. Training with the equipment and drilling is interesting and physically taxing. But, there are also endless hours of cleaning the fire station and inspecting equipment. Larry just showed up one day at Fire Station #2. He was mentally challenged. So, he could not serve as a Fireman. But, if you asked him to do any thing he would start running around and flapping his arms yelling “I am helping… Larry is helping”! at the top of his voice. Mind you… Larry rarely got any thing done. But, he was happy to be part of things and he wanted to help. He found simple joy in just loving people and a willingness to perform the most menial of tasks. I often refer to unselfish people that help others as “Larry”. Beginning in 2007, we will be giving awards to members of the community that help others. Please feel free to nominate a “Larry”. I can’t wait to hear their story and learn something from them.